California has won a landmark judgement with its first anti-spam ruling after a court fined a marketing firm $2m for sending out millions of unsolicited e-mails telling people how to spam. The state's attorney general, Bill Lockyer, brought the case against PW Marketing of Los Angeles County and its owners, Paul Willis and Claudia Griffin in 2002, under a 1998 state anti-spam law. The law was strengthened last month to make it easier to sue spammers. PW Marketing, Willis and Griffin were charged with sending out millions of e-mails, including advertising $39 guides on how to spam, along with long lists of e-mail addresses of California residents. 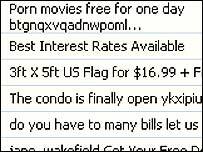 Prosecutors said PW Marketing violated the 1998 anti-spam law because these unsolicited e-mails were sent without a free call number for recipients to phone to stop additional mailings. They also failed to follow state requirements to include a valid return address. The state attorney, Bill Lockyer, also said the owners illegally tapped into computer users' network connections so the company could send e-mails that could not be traced back to its source. The judgement, which Mr Lockyer said will be the model for future spam injunctions, forbids PW Marketing from sending unsolicited commercial e-mails, accessing computers that belong to other people without their permission and disguising its identity by sending messages that appear to originate from a different address. The injunction also forbids Willis and Griffin from owning or managing any business that advertises over the internet for 10 years. After 1 January, the state's anti-spam laws will get tougher and will also allow private individuals to sue spammers and collect damages of up to $1,000 per e-mail.